There is no need to miss a second of Britain’s sailors’ quest for gold in Qingdao next month as the BBC brings you round-the-clock coverage from all the action on the water at Beijing 2008. 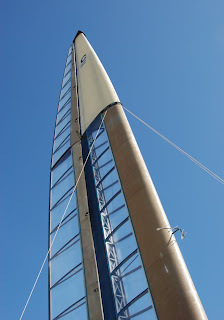 With full race coverage set to start at 6am – the time of the first scheduled warning signal in China – every day on the BBC Interactive ‘Red Button’ service and at least 30 minutes of sailing highlights planned on BBC One every morning, you can watch all the excitement unfold as it happens in Qingdao. 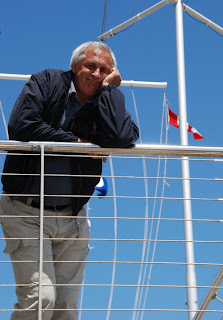 Viewers will be guided through the thrills and spills of the Olympic sailing competition by experienced sailing commentator Richard Simmonds joined by double Olympic gold medallist Shirley Robertson, who will provide expert analysis and insight into the sport. All the interactive coverage will be repeated each evening while an hour-long daily Olympic highlights show will also be tracking Britain’s progress around the sports on BBC One at 7pm. 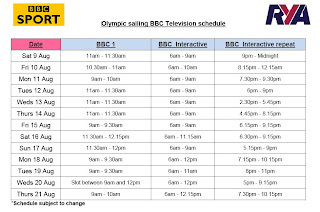 Meanwhile, on Monday 19 August – the day of the scheduled 470 medal races – BBC 5Live will be broadcasting their Breakfast Programme live from the Olympic Sailing Venue while BBC Radio’s Juliette Ferrington will be based in Qingdao for the duration of the Games. Around 300 hours of Olympic drama will be broadcast on BBC One and Two over the course of the Games while BBC Interactive air time will be upped from 1,000 hours of coverage at the Athens Olympics to 2,450 hours in China. 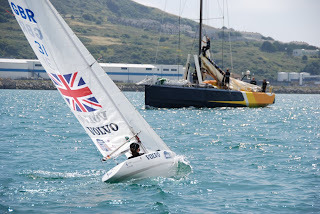 The Olympic Sailing Regatta takes place from Saturday 9 August – Thursday 21 August. All broadcast and event schedules are subject to change. Coming soon: The Carbon Footprint Project. 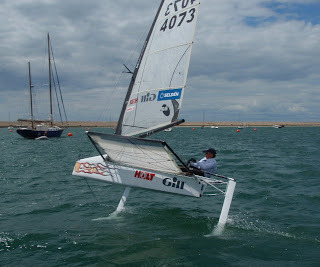 Can’t afford a new foiler? Got an old lowrider and don’t know what to do with it? Worried about your carbon footprint? Why not cut an old lowrider in half? 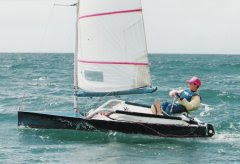 Katherine has been on the fast track foiling programme. 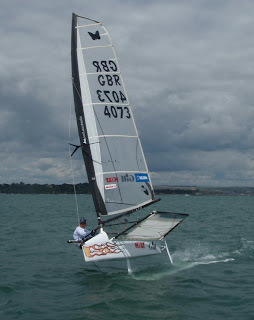 In Feb this year she’d sailed a Topper a few times, crewed a J24 in the Poole club series, and was a bit of a pro Windsurfer, so she bought a Moth! A month or so in she took it to Bristol and did one race of the two race open there. Then she took it to the Nationals, and finished 22nd out of 34. 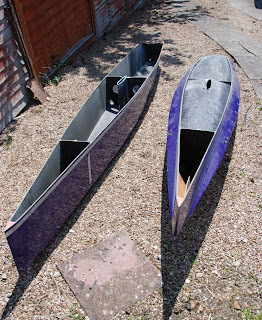 With my new boat nearing completion the deal was that she could use ‘The Weapon’ in the Worlds if my new one was done. It was a punchy call though with only a few days practice before the Worlds! Unfortunately with the windy conditions all week Katherine was one of many who didn’t manage to finish a race. 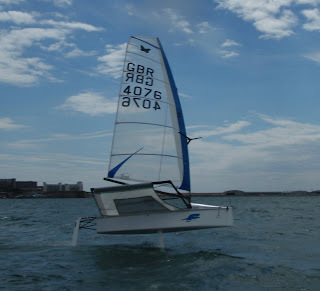 Although she did get a mini rig built on the morning of the first day in an effort to get racing! 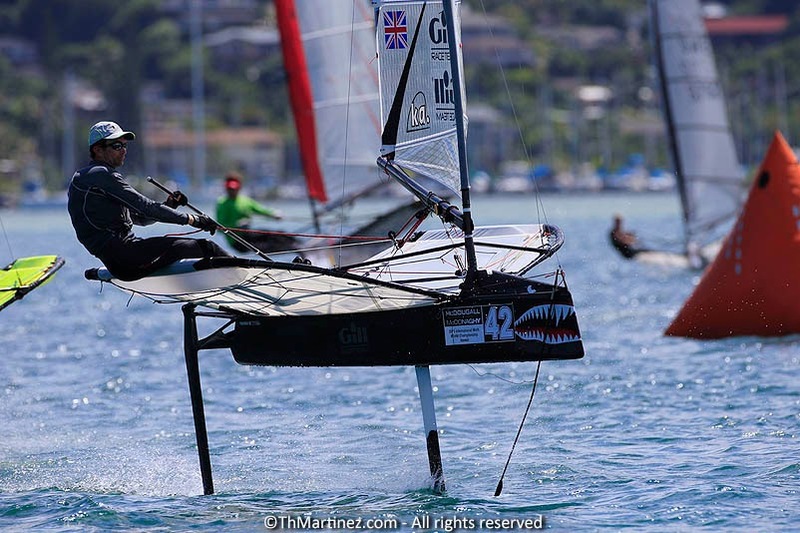 Undaunted though she’s a foiler convert now, and so the old lowrider had to be modified…. After a particularly good sail one weekend (she giggled lots saying that bearing away made her tummy go funny! ), the jigsaw came out that evening, and work began on the ‘Carbon Footprint’ project. Full details in coming posts. 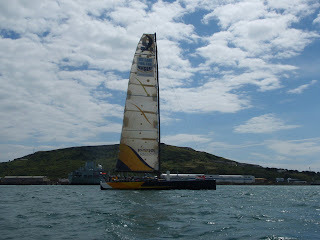 Team Invictus in Weymouth. 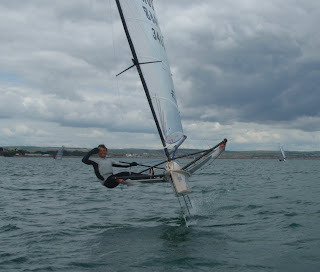 Paul Larson, Helena Darvelid, and the guys from Airbus rigged up their C Class cat in Weymouth at the weekend, and took it for a sail with its new ‘Cogito’ style wingsail. 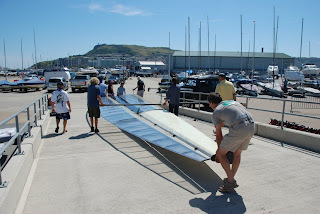 It has taken the Invictus team several years to produce a ‘Cogito’ copy wing like many said was the best option to start with, but I think they learnt a lot from the slow and heavy first wing, and full marks to them for getting the new wing completed. 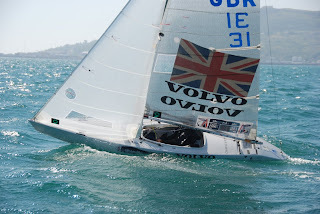 They’ve got many little tweaks to do, but it is great to see one of these fantastic boats sailing in the UK again. I’d forgotten how awesome these boats are. One day I hope to be involved with a full on C Class project. It is perhaps a shame that the Deed of Gift AC this time around was not a multiple challenger event as a ‘Little America’s Cup’ C Class project tagged alongside would have been amazing. 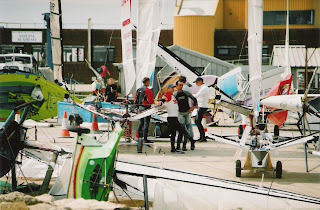 The Canadian and American teams had expressed and interest in travelling with their boats if viable challengers were around so an event in the UK is a possibility. Now that would be an impressive sight. I was up in Birmingham yesterday for a Paralympic team Expo, kit collection/swap, and a gala dinner before the team heads out to China soon. We collected our Adidas squad kit, and our Lee Cooper formal wear, so that is a few more T shirts for the collection and another suit! A good do, but almost a bit of a distraction from training, and getting everything ready before we head out at the end of the month. The 2.4m Helena is sailing in the 2008 Paralympics has been delivered to the airfreight company and soon will be on its way to China. 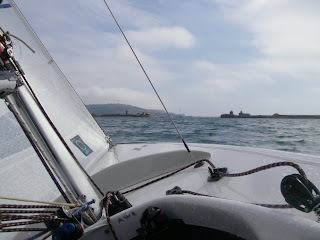 It has been a busy period sailing and testing, so it is nice to be able to breath again although only briefly. 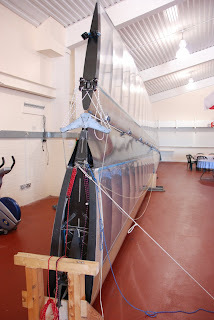 Fri 25th July: The 2.4m Helena is sailing in the 2008 Paralympics has been delivered to the airfreight company and soon will be on its way to China. 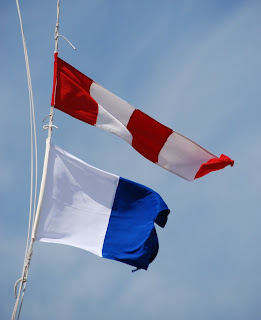 It has been a busy period sailing and testing, so it is nice to be able to breath again although only briefly. 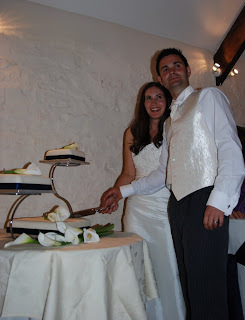 The weekend after the Worlds was my sister's wedding. 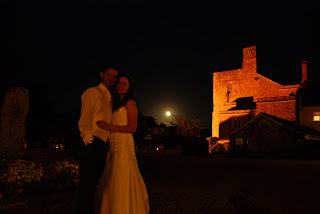 It was a fantastic day over at Bickleigh castle, in Devon. 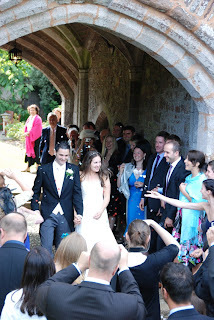 Great setting, sunny weather, superb speeches and a good party. With a good forecast the day after the Worlds several boats stayed around for some sailing. 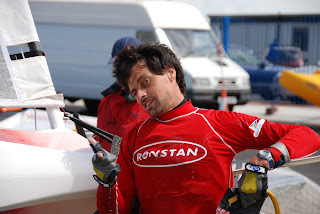 James Roche tried to take out the entire electronics package off the back of the Russian Volvo 70 on a group flyby! 4 races today in plenty of breeze. 2 races, then in for a break and back out for two more. Fleet attrition was high with only 33 of the 99 finishing the last race though. I'm in 13th overall after some average results. Struggled a bit in the breeze early on, but learnt a lot and got quicker as the day went on. Ready for the event to start now! Long AGM today, but that was a function of many countries wanting to hold a Worlds or Europeans for the class, so that is a positive thing. Off to do a boat check, and download some photos. This evening Doug Culnane and I have been reminiscing the build of our old lowriders back in 94, going through old photos. 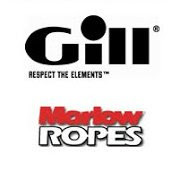 5 batten camber induced rigs, with raking rigs - great boats! 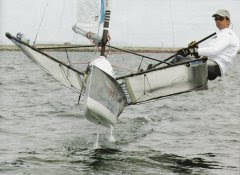 Okay so still not good... J24's got a race in for their Nationals in the Bay the other day, but lost a boat. An unfortunate day for Adam Bowers and his crew. 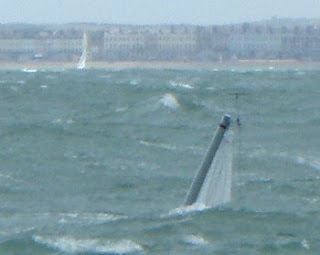 Pic from the Practical Boat Owner website. I can't compete with Scott and Simon in the blogging race, so will resort to technical pics later. With no sailing to talk about we might as well look at some of the boats in between rain squalls. Might be on hold for a bit then. And they're off! - Okay so not the racing, but I'm sure the blogs are all in full swing! Racing canned today so watching the Grand Prix, and the tennis was the call of the day. 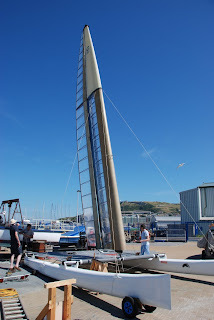 A quick rig up of the 'Knight Rig' 6.55m^2 with many admiring onlookers, was probably the highlight of the day. Amac cast his eye over it, so it is all tweaked ready for racing tomorrow. 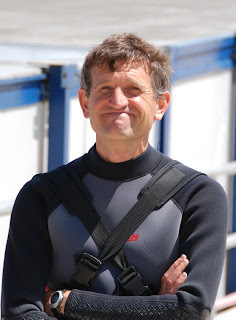 Poor Thierry Martinez was very excited about lots of wind, and even some sun, but it was not to be. The brave had rigged up anyway! Woof woof from the mighty 'Flasheart'! Others just made silly faces! A very quick entry on the eve of the first day. 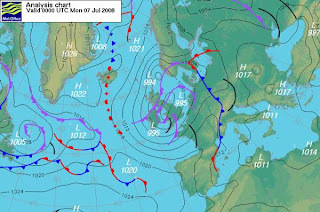 Plenty of breeze forecast so will be interesting to see if we make it out into the 'weather window' our race officer has seen! If we don't get out I get a chilled birthday at home watching the Grand Prix! Great to see 99 boats here! Plenty of interesting bits of kit to be seen, and some impressive displays of pace in some pre-event tuning. Katherine could have called the forecast correctly though and modified my old msl10 this morning into a 6.55m^2 - ready for the breeeze! Plenty of small blokes could be seen looking at it later thinking what a good idea it might be for them! Measurement all done, and feel bad for making most of the fleet redo their sail numbers but sail number sizes and spacings have been in our rules for years, and we've only got a 4 page rule 'book' so it really shouldn't be too hard to get it right. A shake up for all at this event should hopefully mean it is never an issue again. Sorry to all who had to get chopping or moving!